If there was any doubt that the federal bench is in dire need of judges who understand diversity and racial struggles, and who do not adhere to conservative views grounded in white privilege rather than reality, yesterday’s oral argument in Fisher v. University of Texas at Austin at the Supreme Court clearly underscored that need. Yesterday evening, AFJ staff attended a lecture given by Supreme Court Justice Stephen Breyer at Johns Hopkins University SAIS. Justice Breyer focused his remarks on the increased role of international law in the Court’s decisions. There are currently over 1,000 organizations, such as the IMF, that make law that is binding on more than one country. As a result, there has been a sharp spike in the number of cases before the Court that require the Justices to settle the role of international laws and treaties. Regular readers of this blog may recall that the issue of international law and its usage in American courts came up last year during the Senate consideration of Justice Sonia Sotomayor. Justice Breyer explained his frustration with those who complain about the Supreme Court potentially looking at other countries when they are resolving cases involving U.S. law. He noted, “I say that’s a wonderful political debate. It’s good, but it’s pretty irrelevant because when I do read things, I can read what I want.” While recognizing that the U.S. Constitution is a unique document, he explained that if something has been written “by a man or a woman who has a job like mine in another country, and who is interpreting a document somewhat like mine and who in fact has a problem in front of the Court somewhat like mine, why can’t I read it, see what they’ve done? I might learn something.” In a logical manner, he talked about transparency, stating, “I do read it, and if I read it, why don’t I just refer to that fact? I know it isn’t binding, so what’s the problem?” Justice Breyer also spoke favorably about international visits by judges, and learning from other’s experiences in our increasingly interconnected globe. Video footage of Justice Breyer’s entertaining and informative remarks should soon be available at http://www.sais-jhu.edu/pressroom/press-releases/MA2010/breyerpr.htm. Learn more about the role of the courts and why judges matter: http://www.afj.org/connect-with-the-issues/independent-courts-fair-judges.html. Does Sen. Sessions Think Wishing Makes It So? Looks like Senator Sessions (R-AL) thinks that if he keeps saying over and over that Judge Hamilton is too radical to be a circuit court judge, it will somehow come true. Needless to say, Sessions doesn’t think the tone set by United States District Court Judge David Hamilton’s nomination to the Seventh Circuit Court of Appeals is good. Sorry, Senator, but Hamilton has a record that shows him to be a highly qualified nominee who will uphold the Constitution and the law to provide equal justice for all. Judge Hamilton has the backing of both his home state senators, Republican Richard Lugar and Democrat Evan Bayh. Moreover, the American Bar Association gave him its highest rating of well-qualified. And, we would be remiss if we didn’t note that local conservatives who actually know him think he’s a stellar choice. Geoffrey Slaughter, President of the Indianapolis chapter of the Federalist Society, praised Hamilton’s nomination observing, “I regard Judge Hamilton as an excellent jurist with a first rate intellect . . . His judicial philosophy is well within the mainstream.” It doesn’t get much better than that. The obstruction of the Obama administration’s judicial nominees by Senator Sessions and others on specious charges like those leveled today is why there are 96 vacant seats on the federal courts. It appears that Judge Hamilton’s nomination will finally go to the Senate floor for a vote next week. It’s long past time for the Senate to vote on these nominees. With the news that Justice John Paul Stevens has hired only one clerk for the Supreme Court’s 2010-2011 term, many in DC are speculating that this may be his final term on the court. While Justice Stevens’ office has confirmed that he only hired one clerk, they would not comment on the possibility of retirement. Regardless of whether or not we’ll see another Supreme Court vacancy any time soon, the Senate Judiciary Committee is resuming their work to fill vacancies on the federal appeals and district courts. A hearing has been scheduled for next Wednesday, September 9th with Senator Whitehouse (D-RI) presiding. The hearing will consider the nomination of Judge Joseph Greenaway to fill a seat on the Third Circuit Court of Appeals, in addition to district court nominees Roberto Lange for the District of South Dakota, Irene Berger for the District of West Virginia, and Charlene Honeywell for the Middle District of Florida. The hearing will also consider the nomination of Ignacia Moreno to be Assistant Attorney General for the Department of Justice’s Energy and National Resource Division. Hopefully, the scheduling of this hearing is a promising sign that the president’s nominees will move more quickly through the confirmation process now that Justice Sotomayor has been confirmed. And speaking of Justice Sotomayor… Wednesday is shaping up to be quite the busy day. Justice Sotomayor will have an early start to her career as a Supreme Court justice when she hears her first oral argument next week during a special session, the reargument of Citizens United v. FEC. The full Supreme Court term will begin as usual, on the first Monday of October, this year on October 5, 2009. Today, in a vote of 68-31, the U.S. Senate confirmed Sonia Sotomayor as an Associate Justice to the Supreme Court. Sotomayor’s confirmation to the Supreme Court is an historic, groundbreaking event that marks the start of a new day for justice in America. As the Court’s first Hispanic and only its third woman, Sotomayor will have a powerful effect much like that of Justice Thurgood Marshall on the Court and the law. As a highly accomplished, qualified, smart jurist with a rich personal story and varied professional experience, she has proven herself to be fair, reasonable, and committed to upholding the rule of law and core constitutional values. Her confirmation is just the beginning of the significant change that President Obama can bring to our judicial system. Hundreds of federal judges and several more Supreme Court justices will be appointed during his administration. America needs judges who will uphold the Constitution’s promise of equal justice for all. We look forward to the change that Justice Sotomayor will bring to America. Welcome to the Supreme Court Justice Sotomayor! 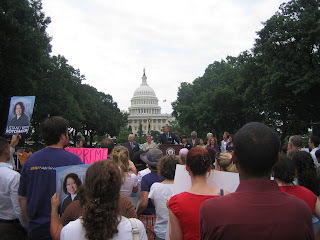 A spirited rally was held today on Capitol Hill in support of Judge Sotomayor’s confirmation to the Supreme Court. Senators Cardin, Schumer, Whitehouse, and Menendez and leaders of several civil rights organizations spoke to the crowd about this historic nominee and her impending confirmation. While it is certain that Judge Sotomayor will be confirmed, likely by tomorrow, one of the clearest messages from this nomination process is that there is an opportunity knocking at the White House door. After four grueling days of testimony before the Senate Judiciary Committee, Judge Sonia Sotomayor has proven that she has the intellect, the discipline, and the temperament, not to mention the grit and the stamina, to merit her place on the U.S. Supreme Court. She graciously and patiently responded to repetitive questioning on the same issues from Republican senators through three rounds of questioning. Throughout, she validated the comments of one of her earliest champions, New York Prosecuting Attorney Robert Morgenthau, who described her as always “a step ahead.” Judge Sotomayor proved herself to be a thoughtful, engaged witness who will be a welcome addition to the Supreme Court and should be confirmed without delay. By contrast, Republican senators showed themselves to be far less interested in Judge Sotomayor’s qualification for the bench than her willingness to adopt a far-right agenda – perhaps believing the two are one and the same. Instead of questioning Judge Sotomayor on her seventeen year record on the bench, Republican senators virtually ignored the thousands of decisions in which she joined to focus narrowly on issues representative of their political agenda. Republicans also used the hearings to promote gun ownership – and their close relationship with gun advocates. Not only did they question Judge Sotomayor at length and over all four days about a single case in which she heard a challenge to a New York weapons’ restriction, they invited gun advocates, including a representative of the NRA, to testify after Judge Sotomayor. Judge Sotomayor resisted efforts to force her to opine on the legality of certain state restrictions on gun ownership that were the subject of challenges likely to come before the Supreme Court in the near future, but consistently pointed out that the case she decided fell squarely within both Second Circuit and Supreme Court precedent, and that as a Second Circuit judge, it was not her place to reverse the Supreme Court. In so doing, she exhibited the sort of judicial deference and restraint that Republicans so often say they look for in judicial nominees. Although the hearings focused little attention on Judge Sotomayor’s legal record, Republicans turned again and again to speeches she gave at law schools around the country, and her Board work on behalf of the Puerto Rican Legal Defense Fund (PRLDEF), a nonprofit based in New York which is dedicated to protecting and advancing civil rights. One Republican witness, Linda Chavez, a Reagan appointee, even turned to Judge Sotomayor’s college thesis to support her personal challenge to Judge Sotomayor’s qualifications for the Supreme Court. In the end, however, Judge Sotomayor firmly and unwaveringly affirmed her commitment both to her own heritage as a source of inspiration, and the rule of law as a guiding principle in her jurisprudence. In a statement during her first day of testimony, Judge Sotomayor was unequivocal: “I do not believe that any ethnic, racial, or gender group has an advantage in sound judging. I do believe that every person has an equal opportunity to be a good and wise judge regardless of their background or life experiences.” She never wavered from this principle in her testimony, nor is there any evidence in her lengthy jurisprudence that Judge Sotomayor has ever allowed her personal beliefs or her heritage to guide her legal decision-making. Judge Sonia Sotomayor has the legal acumen, intellect and judgment needed for a seat on the nation’s highest court. As a woman who has dedicated long hours to reaching back and inspiring students, women and people of color to pursue their dreams and take pride in the legal profession, and who “remembers where she came from,” she will bring a much needed perspective. We look forward to seeing her take her well-deserved place on the Supreme Court. Today was the fourth and final day of Judge Sonia Sotomayor’s confirmation hearing to the Supreme Court. The day began with only four Senate Republicans and approximately eight Senate Democrats remaining in the second round of questioning. However, at the request of committee Republicans, Senator Leahy graciously allowed each member another ten minutes during a third round of questioning. By the end, Judge Sotomayor had sat before the committee for over twenty four hours. The themes of the previous days’ questioning continued, with Republicans aggressively questioning Sotomayor about her views on the Second Amendment, international law, her involvement in the Puerto Rican Legal Defense and Education Fund, and her decision in Ricci v DeStefano. Senate Democrats emphasized her impeccable qualifications, inspiring life story, and solid judicial record. Senator Kyl was particularly tough in his approach. He grilled her on her decision in Ricci, but Sotomayor held her ground, contending that precedent dictated the result of the three judge panel, and that the Supreme Court had created a new legal standard in its decision to overrule the Second Circuit. Senator Kyl mistakenly concluded that all nine Supreme Court justices disagreed with the Second Circuit’s decision, a point that both Sotomayor and other commentators have noted is incorrect. In fact, four justices of the Supreme Court made very clear that they would have affirmed the Second Circuit’s decision. Senator Graham’s questioning of Sotomayor was also striking, as it seemed to lay the groundwork for a vote in favor of the nominee. He remarked that she was “broadminded” and agreed that her “wise Latina” comment was not meant to encourage race or gender discrimination or preferences. Graham also stated that he did not think Judge Sotomayor was a “judicial activist,” a worn-out buzz word used by the right to waylay nominees. Ironically, while Senator Coburn decried the use of foreign law to interpret the Constitution or laws of the United States, he encouraged judges to look to the rest of the world when it came to a woman’s right to choose, claiming that 80% of the rest of the world doesn’t allow abortions after twelve weeks. At the conclusion of committee questioning, a number of witness panels appeared before the members. The American Bar Association testified on behalf of Judge Sotomayor, giving her their highest rating of “well qualified.” New York City Mayor Michael Bloomburg, New York County District Attorney Robert Morgenthau, Arkansas Attorney General Dustin McDaniel, and Wade Henderson President of the Leadership Conference on Civil Rights also testified and spoke to her character, competence, and suitability for the Court. Additionally, witnesses for the minority testified, including Frank Ricci and Benjamin Vargas of the New Haven Fire Department (Ricci plaintiffs), Peter Kirsanow of the U.S. Commission on Civil Rights, and conservative commentator Linda Chavez. It was clear that the Ricci plaintiffs elicited empathy from Republican Senators for the burden the suit had placed on their families and the unsatisfying result they received in both the district court and the Second Circuit. Indeed, it appears the Republicans believe there is a place for empathy in our judicial system after all, as long as the result is one with which they agree. Theme of Day Three of Sotomayor Hearings is "Asked and Answered"
Day three of the Judiciary Committee hearings saw more of the same from the Senate Republicans. In stark contrast to the kid gloves they used with Justices Alito and Roberts during their confirmation hearings, Republicans aggressively questioned Judge Sotomayor. Nonetheless, she handled herself with the poise and patience she has exhibited throughout the hearings. Although she was careful not to prejudge issues that might come before the Supreme Court, Judge Sotomayor continued to answer the senators’ questions with candor and insight. After a break for a closed door session the hearing resumed with the beginning of the second round of questioning. So far, the second round has been more of the same from the Republicans on the Committee. Senators Sessions (R-AL) and Hatch (R-UT) continued to question Judge Sotomayor on her “wise Latina” comment. Judge Sotomayor patiently reiterated that it was a remark that “fell flat” and was intended to inspire a group of students. She continued to recognize that it might be misunderstood and sought to correct the impression of those who took her comment the wrong way. Day four will continue with the second round of questioning of Judge Sotomayor before the Committee moves on to testimony from witnesses including members of the American Bar Association’s judicial rating panel and Frank Ricci, one of the litigants in this term’s “New Haven firefighter” case. Perhaps we’ll hear something new from Senate Republicans tomorrow. Last Wednesday we wrote about a letter in support of Judge Sonia Sotomayor’s nomination to the Supreme Court that had been signed by “almost 1,200” law professors from across the country. Today, during the Sotomayor confirmation hearing, Senate Judiciary Committee Chairman Leahy introduced the letter into the record with 1,200 signatures. An impressive number that shows clear support of Judge Sotomayor’s confirmation. Today, day three of the hearing starts at 9:30 a.m. Senators Cornyn, Cardin, Coburn, Whitehouse, Klobuchar, Kaufman, Specter and Franken still need to question Judge Sotomayor to finish round one of the questioning. Once the first round of questions is complete, the Committee will break and hold a closed session with Judge Sotomayor. The closed session is routine procedure for Supreme Court nominees and will involve questions about her FBI background check. The hearing will reconvene following the closed session and lunch break in the afternoon to start the second round of questions when senators are permitted up to 20 minutes of questioning. At the end of the day yesterday, however, Chairman Leahy politely asked senators who do not need their full 20 minutes for questions to be brief so that the hearing does not drag on. Today was the first day that Judge Sotomayor answered questions from the Senate. The questions, ranging from the relevant to the wildly inane, covered many topics including Judge Sotomayor’s judicial record, speeches, and her background with PRLDEF. The main focus of today’s hearing was the Ricci case, the Judge’s remarks that she hoped a wise Latina would come to a better legal conclusion than a wise old man, and the Maloney 2nd Amendment case. Senators Kyl and Hatch among others questioned Judge Sotomayor at length about her understanding of the Second Amendment, the foundations for the right to privacy in the Constitution, and her views of stare decisis. In response to each question, Judge Sotomayor was reasonable, authoritative, and extremely forthcoming. In short, she demonstrated precisely the intelligence and temperament that will serve her well as a Justice on the Supreme Court. Stay tuned for more updates tomorrow as the senators finish their first round of questioning. Can Baseball Survive the Supreme Court Confirmation Process? Judge Sonia Sotomayor may be hailed as the woman who saved baseball, but her hearings, along with those of John Roberts and Samuel Alito are threatening real damage to the sport. Supreme Court nominee Judge Sotomayor’s hearings will explore many hot-button issues, including abortion, the taking of property, guns, and Jeff Sessions’ view that our civil rights laws were enacted to redress this nation’s long history of oppression of the white race. But, so far no topic has received more mention than baseball – our Great National Past Time, the perfect game that is deeply embedded in our national DNA. Before it is too late, we need to declare a moratorium on baseball analogies applied to the courts. The mess started with John Roberts’ inaccurate and disingenuous description during his confirmation hearing of a good judge as a baseball umpire, whose job is simply to call balls and strikes as he or she sees them. As others have pointed out, the comparison was simplistic and flawed in many ways, but we have now entered a new danger zone. Republicans seem to be wedded to the analogy, particularly as used by John Roberts. But, even a cursory look at the chief justice’s record shows that every pitch thrown on behalf of business and against consumers is a strike. Every pitch thrown by a prosecutor splits the strike zone, but every pitch thrown by a criminal defendant bounces off the backstop. Every pitch thrown by a minority civil rights claimant bounces in the dirt, but pitches thrown by white civil rights plaintiffs all go right down the middle. Gun owners have unerring aim when targeting John Roberts’ strike zone, but environmentalists, despite wearing out their arms, have yet to get one over the plate. And the amazing thing is that observers know how John Roberts will call pitches before they are even thrown. So, the logical conclusion to draw from Republicans’ repeated invocation of the John Roberts-as-umpire analogy is that baseball umpires no longer need to look at pitches; they merely need to know who is pitching. Indeed, Roberts and his cronies on the right have decided to revise the rules of baseball to fix the game even more. The Court’s last act of the past term was to schedule reargument in Citizens United v. FEC, a case presenting the question whether a 90-minute film slamming Hillary Clinton was subject to federal campaign finance disclosure and disclaimer requirements. The conservatives on the Court ordered the parties to brief a much broader issue, designed to give the Court a vehicle to strike down federal restrictions on commercial corporate money flowing to candidates – an outcome that will prove particularly beneficial to Republicans who, for the first time in memory, find themselves trailing Democrats in campaign money. The Court’s action strips away any suggestion that the so-called conservatives on the Court are anything other than overt judicial activists who are trying to reshape the Court’s docket to allow them to decide the issues they want to reach, whether they are presented by the parties or not. They have abandoned the traditional conservative view of the Court as a passive institution that takes the cases as they come and decides the case before it. In other words, the conservative members of the Court now appear to think that an umpire can tell the pitcher what pitch to throw if he wants it called a strike. It’s time to stop the baseball analogies now. If we don’t quickly divorce baseball from this Court, it will ruin baseball. Stay tuned as we will be releasing more fact sheets on our website as issues arise throughout the hearing. Judge Sotomayor’s moving and thoughtful opening statement promises more insight to come from the judge as the questioning gets under way. Like her record, Judge Sotomayor’s statement reflects a commitment to the rule of law and core constitutional values. best known case involving the Major League Baseball strike in 1995. The Senate Judiciary Committee is in recess until tomorrow morning at 9:30 am when senators will get their chance to ask Sotomayor questions directly. Tomorrow may bring more surprises than today, which was limited to opening statements. There were a few short outbursts, however, which goes to show that the hearing for the first Latina Supreme Court nominee is not immune to protest. Today, we at AFJ are releasing fact sheets on our website discussing various issues that have been raised during senators’ opening statements at today’s confirmation hearing. If you want to learn more about the issues at hand check out the recently released fact sheets on international law, the takings clause, and original intent. We will add more fact sheets as the hearing progresses, so if there is anything in particular you want to know more about, let us know and we’ll be sure to address it. In case you missed it, last week we posted our analysis of the Ricci case on Huffington Post. The hearing will resume at 2pm today and we’ll get to hear from Senator Franken as he makes his debut on the Senate Judiciary Committee. @ cbhutton: RT @NanAron: has great coverage of the confirmation hearing! Best use of twitter I’ve seen. You can read the full transcripts of the senators’ opening statements on the Senate Judiciary Committee Website. So far eleven senators have given their statements, so eight more statements remain before we get to hear Judge Sotomayor’s opening statement. She will have an opportunity to respond more directly to some of the mischaracterizations of her record tomorrow, when the actual questioning begins. Judge Sotomayor is no stranger to the Senate Judiciary Committee; she has been confirmed twice already, first to her district court seat, and then for her seat on the Second Circuit Court of Appeals, though a Supreme Court hearing brings with a much greater level of attention and scrutiny. So, there will likely still be drama at the hearing–. and we’ll be bringing you commentary every step of the way. Follow AFJ President Nan Aron on Twitter and check back here regularly for updates. For more about Judge Sonia Sotomayor, please see our Supreme Court Watch page. The Senate Judiciary Committee will convene Monday morning at 10:00 a.m. to begin the hearing on Sonia Sotomayor’s nomination to become an associate justice of the Supreme Court. The hearing will be a consequential moment in our history, but not so much because the confirmation of Judge Sotomayor is on the line. Barring some unforeseen and very unlikely event, Republicans will quickly back off attacks on Judge Sotomayor herself. They recognize that it is politically dangerous to criticize her given her appealing personal story of rising from a housing project in the Bronx to the pinnacle of our judiciary through enormous talent and hard work, her record as a moderate who feels bound to follow the law strictly on the bench, and her ethnicity and gender. Instead, they will use the occasion to promote their distorted view of the law – not what it is but what they would like it to be in a republic ruled by hard-right judicial activists such as Chief John Roberts and Justice Samuel Alito. For that reason, the week will offer an enormously important contrast between the nominee and her supporters and this ominous Republican vision. So, what are the themes that Republicans will raise in response to Judge Sotomayor’s nomination? First, they will highlight the Ricci case, the challenge by white firefighters to New Haven’s voluntary effort to avoid discrimination against minority firefighters. Judge Sotomayor, of course, sat on a panel of the Second Circuit that summarily affirmed the lower court’s decision that New Haven’s decision to scrap a test for promotion of firefighters to avoid disproportionately excluding black and Hispanic applicants was consistent with Title VII of the Civil Rights Act of 1964. Repudiating decades of settled civil rights law, the Supreme Court reversed that decision in a 5-4 opinion. The five conservatives on the Court, who have traditionally been hostile to claims of discrimination by minorities, created a new rule and broke with standard practice by directing judgment for the white firefighters, rather than sending the case back to the lower court so that New Haven could prove that it met the new standard. While Republicans will criticize Sotomayor’s participation in the panel decision and will bring in the lead plaintiff, Frank Ricci, to testify (surely they would not suggest that empathy for Ricci should influence the result), the fact remains that 11 of 21 judges who reviewed Mr. Ricci’s claim ruled against him. Judge Sotomayor can hardly be considered out of the mainstream or at fault for failing to apply the law that the conservatives made up when the case reached the Supreme Court. Republicans will also use the hearing to promote guns. In their continuing quest to ensure that every American is armed, they will criticize a decision in which Judge Sotomayor, sitting on a unanimous panel of the Second Circuit, held that the Second Amendment to the Constitution, which ensures against federal limitations on an individual right to bear arms, does not prohibit state limitations on guns. Unfortunately for Republicans, the Supreme Court has held the very same thing three times. To find fault with Judge Sotomayor’s decision, her critics have to argue that she should have thrown the rule of law to the winds and ignored Supreme Court precedent. Even conservative icons of the bench, Judges Frank Easterbrook and Richard Posner, have agreed with Judge Sotomayor on this issue. That, however, is unlikely to stop conservatives from using the occasion to lecture about the sanctity of the Second Amendment as a guarantee of fundamental rights. Republicans will also raise questions about abortion – even though Judge Sotomayor has never ruled on abortion and does not have any known public statements on the issue. In any event, support for Roe v. Wade, which is the law of the land, can hardly be a ground for disqualification from the Supreme Court. There will be no traction in criticizing Judge Sotomayor on this issue, but Republicans are likely to use the opportunity to burnish their anti-choice credentials, as if anyone had any doubt. Republicans will criticize Judge Sotomayor for two decisions involving takings of private property by local governments. Again, both decisions are based directly on Supreme Court precedent – namely the Court’s controversial but binding decision in Kelo v. City of New London. Because Kelo has proven unpopular, however, Republicans will try to tie Judge Sotomayor to it in a critical manner, even though it remains the law of the land, which she, as a judge, is required to apply. Finally, Republicans will attack the activities of the Puerto Rican Legal Defense Fund (PRLDEF), which Judge Sotomayor served as a member of its Board of Directors prior to going on the bench. PRLDEF is an outstanding organization that has done exceptional work in promoting civil and constitutional rights. It operates in the great tradition of the NAACP Legal Defense Fund and other public interest legal organizations that have helped America to fulfill its promise as the cradle of liberty and opportunity. Republicans should be ashamed of trying to score political points off of Judge Sotomayor’s commitment to the proud tradition of public interest law. Today, law professors from across the country released a letter in support of Judge Sonia Sotomayor’s nomination to the Supreme Court. With almost 1,200 signatories from 170 law schools in 49 states (Alaska does not currently have a law school) the letter has been signed by many renowned legal scholars from across the ideological spectrum. On a call today, six of those professors: Charles Ogletree (Harvard), Laurence Tribe (Harvard), Arthur Miller (NYU), Daniel Richman (Columbia), Evan Caminker (Michigan), and Robert Weisberg ( Stanford) –further explained the outpouring of support for Judge Sotomayor in the legal community. Professor Arthur Miller of New York University noted that Judge Sotomayor’s legal background will make her a refreshing addition to the Court. “She will bring to the court rich experience at the trial and appellate level. She will bring that trial experience to a court that is 100% appellate in background with no experience in the trenches.” He further explained that much of what the Supreme Court does is promulgate rules for trial judges and juries to follow, and having a justice with trial experience will help the Supreme Court better craft those decisions in a way that lower courts can more easily apply. Professor Miller ultimately described Sotomayor as a “centrist whose crowning characteristic will be her professionalism” and he is “delighted that someone who brings process, craft, caution, respect and a great deal of tolerance” has been nominated. The letter was given to the Senate Judiciary Committee only days before the confirmation hearings will begin on July 13th. Professors also predicted that the wide range of support Sotomayor has received leading up to the hearings is a testament to just how confirmable she is. The Minnesota State Supreme Court declared Al Franken the winner in the Minnesota Senate race, and opponent Norm Coleman conceded. Franken will be seated in the Senate next week and will join the Judiciary Committee in time for the Sotomayor confirmation hearings on July 13. We welcome Franken to the committee and hope that he finds our in-depth reports on Judge Sotomayor’s record helpful reading before the hearings commence. We also hope that his arrival in the Senate will move forward the long overdue vote on Dawn Johnsen’s nomination to head the Department of Justice’s Office of Legal Counsel. Savana Redding, a 13-year-old, was subjected to a strip search at her middle school to determine if she was the source of ibuprofen pills among some fellow students. With Savana traumatized and humiliated by the search — which found no drugs — her mother sued the school district, the Vice Principal who gave the order, and the staff who conducted the search. Today, the Supreme Court relented in its assault on the rights of students by holding the strip search of Savana Redding unconstitutional. The Court’s decision in Safford v. Redding regarding the constitutionality of the search, joined by every justice except Clarence Thomas, recognizes not only Savana Redding’s account of her search as embarrassing, frightening and humiliating but that adolescent vulnerability intensifies the exposure’s patent intrusiveness. While today’s decision was not an unqualified triumph for Savana Redding, she has secured a victory for schoolchildren nationwide. Her battle to vindicate her own rights has led the Supreme Court to issue a ‘clearly established’ ruling securing the constitutional right of millions of American students to be free from a humiliating, unjustified and unreasonable strip search. Yesterday, Alliance for Justice released a report and hosted a telebriefing for the press on Judge Sonia Sotomayor’s business and consumer law record. Joining AFJ in the briefing were Prof. Eduardo Peñalver of Cornell University Law School and Hispanics for a Fair Judiciary, and National Consumers League Executive Director Sally Greenberg. This report, the third in a series on Judge Sotomayor, examines her consumer and business law record, including labor and environmental law, bankruptcy, consumer protection and intellectual property among other issue areas. For those of you who are baseball fans, or simply curious about President Obama’s comments regarding Judge Sotomayor’s “saving baseball” you may find the section on labor law of interest. The report examines the case Silverman v. Major League Baseball Player Relations Comm. Inc.; Judge Sotomayor ended the 1995 baseball strike by issuing an injunction against baseball owners – allowing the players to go back to work and the baseball season to begin. Sally Greenberg and Eduardo Peñalver also provided insights on the broader lessons that can be gleaned from Judge Sotomayor’s record in this area of the law. “Judge Sotomayor wants people to have their day in court, rather than letting inconsequential technicalities prevent people from being heard,” observed Greenberg. “She meets issues of first impression with caution and careful analysis. She’s very much in the tradition of a careful, respectful common law judge, much like the justice she will be replacing, David Souter,” Peñalver noted. The current economic climate means issues relating to business, bankruptcy, and consumer protection are more important than ever. Judge Sotomayor has extensive experience in these areas of the law and, as the report notes, her legal writings show her ability to “recognize the impact her decision will have on the parties involved in a case, [while betraying] no preset notions or biases.” You can read the full report here. This morning the Campaign to Stop Corporate Immunity held a conference call that included a campaign update, as well as a short presentation from Alliance for Justice on Judge Sotomayor’s record on preemption. Jennifer Meinig, Legislative Counsel for AFJ, shared data from AFJ’s recently released report focusing on Judge Sotomayor’s access to justice cases. Judge Sotomayor has ruled on only a few preemption cases, but has exhibited a characteristically measured approach in her rulings. The decisions reflect a rigorous analysis and Judge Sotomayor delves deep into the facts of cases reflecting the complex interplay between state and federal law. Ms. Meinig gave a few examples of cases that typify Judge Sotomayor’s rulings involving preemption including, Protection & Advocacy for Persons with Disabilities v. Kirk, 448 F.3d 119 (2d Cir. 2006), Patient Protection & Advocacy, Inc. v. Houstoun, 228 F.3d 423 (3d Cir. 2000), and Empire Healthchoice Assurance v. McVeigh, 396 F.3d 136 (2d Cir. 2005). These cases, and others, are explored in detail in the Access to Justice report. The Senate Judiciary Committee announced today that the confirmation hearings to consider the nomination of Judge Sonia Sotomayor to be an Associate Justice of the United States Supreme Court will begin on July 13, 2009. Judge Sotomayor returned the Committee’s bipartisan questionnaire on June 4. The questionnaire and attachments are available online. The date of the hearings is consistent with the average timeline for a Supreme Court nominee’s confirmation process, and should allow Judge Sotomayor to be confirmed in time for the start of next year’s Supreme Court term which begins in October. Yesterday we released the first in a series of in-depth reports on Judge Sotomayor’s record. Alliance for Justice will release a new report a week leading up to the hearing, providing thorough analysis of key areas of Judge Sotomayor’s record: access to justice, criminal law, civil rights, constitutional law and business and consumer law. The first report on access to justice is available on our Supreme Court Watch page. Today Alliance for Justice unveiled the first in a series of in-depth reports analyzing Supreme Court nominee Judge Sonia Sotomayor’s record. to justice issues. Her rulings are well within the legal mainstream. She closely follows precedent, and analyzes facts with meticulous detail. Visit our Supreme Court Watch page for more information and to read the report in its entirety. Alliance for Justice co-sponsored a panel at today’s America’s Future Now conference on the importance of the courts. Nan Aron, President of AFJ introduced the session by reminding the audience that while the nomination of Sotomayor is an historic, ground breaking event, that is just the beginning. Judge Sotomayor’s confirmation hearing will start that process. But it is up to us to urge the Obama administration to appoint judges who will uphold the Constitution’s promise of equal justice for all. Learn more about the Supreme Court and Judge Sonia Sotomayor on our Supreme Court Watch page.